Brebes Regency is known for its culinary and beautiful highlands. No wonder, lots of tourists come to the region regardless their location. However, Brebes offers more than those attractions. It is because visitors can also witness various traditional dances at a specific time. Thanks to the Indonesian locals. They keep retaining such art performances for generations, especially as an entertainment. The fact is that tourists can find many types of them including Topeng Dances, Kuda Lumping, Reog Banjarharjo Dance, and Ronggeng Kaligua Dance. Each of these dances is unique and offers a distinct entertainment to the audience! In terms of nuance, all dances emit both fun and sacred atmosphere. As if, the dancers hypnotize the audience during the performance. Moreover, each dance features distinct movements and attires! No wonder, tourists won’t get bored watching them. They must consider several things, though. First, it is related to the time. The fact is the dances are performed only at a specific time, so tourists should get the schedule first. The next consideration is related to the place. Make sure to look for information regarding where the dances will be performed first before heading to Brebes. No wonder, hiring a local guide is quite recommended. When it comes to traditional dances of Brebes Regency, many tourists may have recognized several mask dances. One of them is called Losari Mask Dance! As the name suggests, it develops in Losari Sub-District and has been influenced by the neighboring region which is Cirebon Regency. The dance tells a story of a man called Joko Bluwo, who has an ugly face. He wanted to propose to a beautiful princess Candra Kirana. Somehow, he was successful as he was able to defeat a giant who also wanted to propose to that woman. 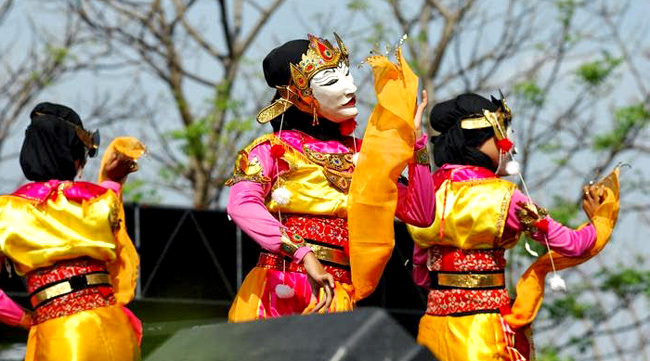 Another popular mask dance that tourists can enjoy in Brebes is called Sinok. The founder was Suparyanto, actually. The dance shows the beauty and travail of a woman. In a nutshell, it represents all the women who live in Brebes. What is more? There is also Reog Banjarharjo Dance. Even though it is almost extinct, the dance keeps attracting tourists from other regions. One thing, it is a little bit different as compared to that of Ponorogo’s Reog. The next popular traditional dance in Brebes Regency is called Kuda Lumping. In terms of name, “Kuda” means a horse and “Lumping” means animal’s leather. No wonder, the dancers use such ornament during the performance. Not only the dance looks unique, but it also emits a mystical nuance as well! Another interesting dance to enjoy is called Ronggeng Kaligua. The purpose of this dance is to entertain the audience. As the name suggests, tourists can enjoy this at Kaligua region. The best way to watch those dances is to come to Brebes Regency directly. From Semarang City, tourists may spend about 5 hours to get to the destination. It is because the distance is 210 km. Once arriving at Brebes City, they can look for a local guide and get the information regarding those dances right away.